Hats off to The Opera House Players as they celebrate their 50th anniversary of producing and performing quality and affordable musical theatre in northern and central Connecticut. 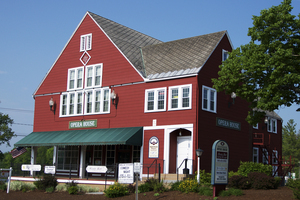 Although sad to leave their home of the past 15 years in the historic Broad Brook Opera House, they plan on returning to their original location in Enfield, CT next season and continue their mission. For all its quirkiness and theatrical challenges (virtually no wing space, no access to backstage without passing through the audience, no orchestra pit) the Opera House is homey, comfortable, rife with charm and historic interest, and there is not a bad seat in the house. The show “Sister Act,” is not to be confused with the movie of the same name. The musical has a completely different score. The songs are much more Broadway and less Hollywood, with no shortage of rousing numbers, just made for harmonizing and choreographic opportunities for women in habits. Depending entirely on its actor/singers to carry the energy and character development, there are minimal sets or technical aspects. With a somewhat slow start, the musical picked up speed, and by the finale the audience was on their feet with enthusiasm and appreciation for the obvious energy, fun and talent displayed by the cast and this heart-warming tale of forgiveness and redemption. Especially notable were Mother Superior, played to a the hilt by newcomer to Opera House Players Jenna Levitt; and Tracy Funke as Sister Mary Patrick -- a real scene stealer with her high energy and exuberant dancing. Dennis J. Scott portrayed the perfect villain and his side kicks made equally entertaining back-up singer/dancers. Jim Metzler was hilarious as the deadpan Monsignor; and as Deloris, Nikita Waller’s vocals were fabulous, sensitive and not overplayed. The skillful five-piece pit band lead by Kim Aliczi did a stupendous job of providing all the high powered momentum without drowning out the performers. “Sister Act” was an evening of pure, unadulterated fun.